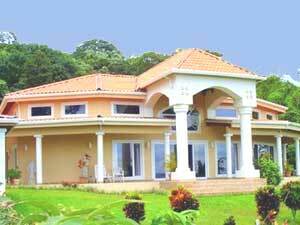 This is a beautiful property of over 12 acres (49,800 square meters). 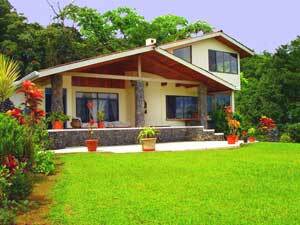 It includes a spacious main house and 4 additional villas, and is professionally landscaped and gated, with more than 1.3 km of paved road with concrete drainage. 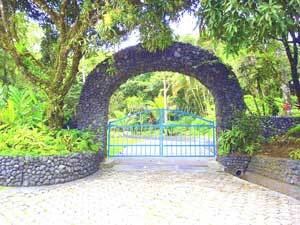 There are two wells, an extra 1000-gallon septic for future construction, all utilities, beautiful walls of lava stone and plantings of many species and much more. 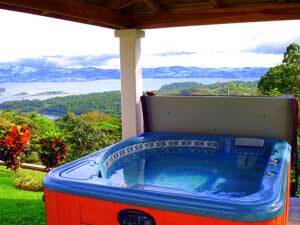 All of this with some of the Most Magnificent Views in all of Lake Arenal. 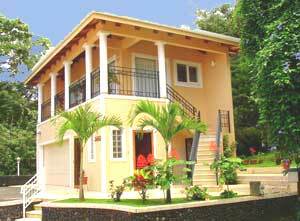 It is suitable for a family compound, bed and breakfast or vacation rental villas. The total appraised value of land, buildings, pool, furnishings and equipment is $2,977,500. Owner financing is available. Casa Grande is called "grande" because, of course, it is large, with ceilings over 20 feet high made of imported almond beams and cedar. 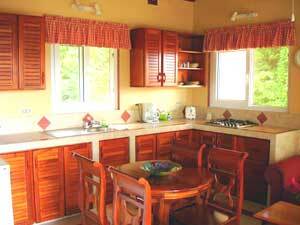 Casa Grande has a designer kitchen with granite tops, modern appliances and comfortable dining for 8. The living area is 55 feet long with 3 areas to relax. It come with beautiful furniture from the United States and is decorated completely by a leading Nebraska decorator. It has an entertainment center for viewing direct T.V. There's a social area with more beautiful furnishings and views out of 33 feet of windows. It even has a functioning fountain. 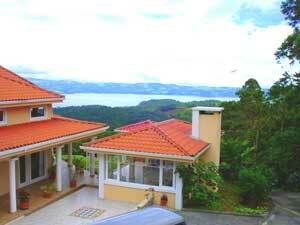 You won't believe the incredible panoramic view of the lake and the mountains. 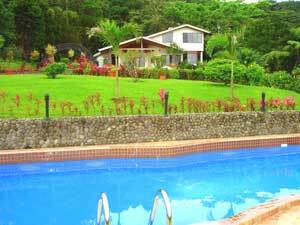 You can see all the way to Monteverde as well as to Arenal Volcano. One area has seating for playing cards or games or enjoying the view and snacking. There is a wet bar with an under-the-counter refrigerator and a Bose Radio for music. Next is the spectacular master suite with a king bed (see below), walk-in closets for him and her, a quite large master suite bath with a grand shower and two vanities. There are two other bedrooms, one with a private bath and the other sharing a half bath. The laundry is as large as a bedroom. Outside, the house is surrounded on three sides by a large covered veranda. Here's the view from Casa Bella Vista of Casa Grande and its "rancho," where the jacuzzi is located.The rancho is a stand-alone building open on one side to view all of the lake and forest. It has a fireplace and a grill for cooking out and dining. Covered by a roof matching the Casa Grande roof, the jacuzzi has fresh spring water and looks out over the lake and forest. The Pool is approximately 15 x 30 feet and shares the magnificent views. A large, landscaped gateway on the lake highway leads to the 12-acre property with its combination of landscaped and original terrain. There is substantial undeveloped area on the property in addition to all that has already been developed. There is also much room to expand. 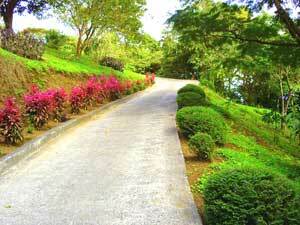 There are two plateaus on the upper part of the property that are a must-see. They have spectacular views and are ready to build on. 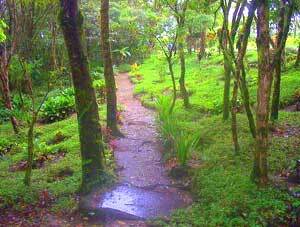 There are other wooded and cleared areas of the property that have a huge potential. 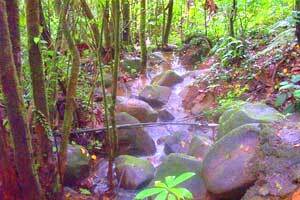 A stream runs through the beautiful, wildlife-rich forested part of the property. 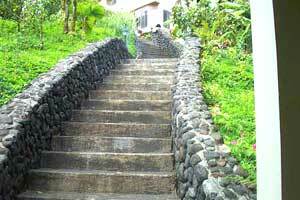 In landscaped areas, there is excellent stone and cement work on the paths, stairs and driveways. 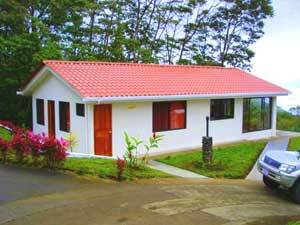 Casa Primera: This is the first house to be built on the property. 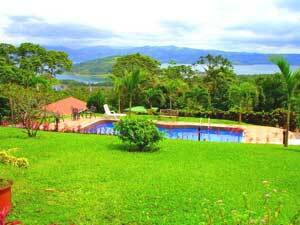 It has a panoramic view of Lake Arenal, and the large pool is just steps away. There's beautiful woodwork and ceramic everywhere. The first floor has two bedrooms, each with its own private bath and entry. One is a king bedroom and the other has twin beds. There is also a cute powder room at the front door. Upstairs there is the third bedroom with a queen bed and private bath. Another door leads out to your own private balcony. The views of the lake out of the windows are wonderful. 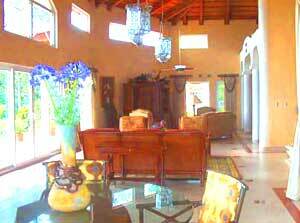 Casa Bella Vista: Named for the magnificent views you will have, this villa is built over a 2-½-car garage. The garage has a designer ceramic floor and an authentic antique sink for washing up. Also there is a bathroom and a shower for the gardener. 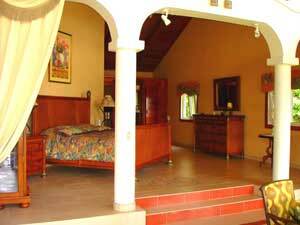 The villa above is a lovely large room with a queen bed, (handmade wood), a tasteful kitchen, and a living area with a fold-out queen sofa. It also has a private elegant bath. 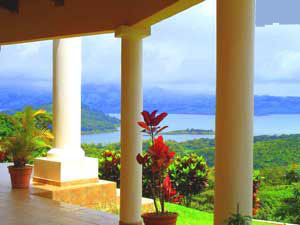 You will love the incredible views from the front veranda. The Enchanted Cottage: This villa was created and designed as a mystical and enchanting one-king- bedroom villa. The front veranda is completely enclosed and has plenty of room for dining, relaxing and entertaining. It also has a wet bar. Entering the front door you will see a large area consisting of custom-made wood kitchen cabinetry, ceramic counters and backsplash. 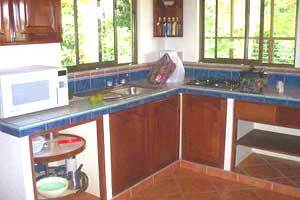 It's fully stocked with pots, pans and dishes and has a beautiful ceramic tile floor throughout. The living area has a fold-out queen sofa and additional seating. The bathroom has a large shower and is also finished in beautiful ceramic tile. There is a large king bedroom, private and cozy. There is also a side door that exits to beautiful concrete and volcano rock stairs ascending to Casa Primera. 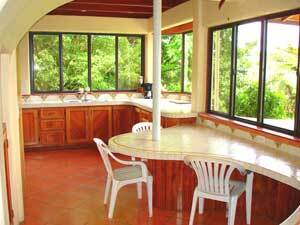 Outside, the veranda wraps around and you can hear the river, view the forest and wildlife, and even see the lake. Other features of the property include an innkeeper villa and office: This is a one-bedroom, one-bath home used by the innkeeper and his wife. 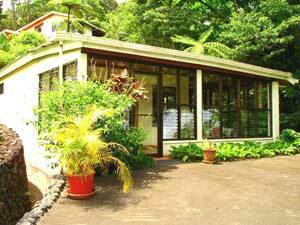 It includes a large enclosed front veranda where we currently serve breakfast to our guests. 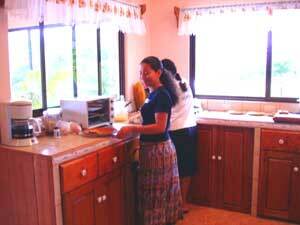 (In the photo at right, B&B staff prepare breakfast for guests.) Also, there is an office in the rear and a laundry. It has an outside entry for a powder room to be used by the pool visitors. There is also a bodega used by the gardeners to store equipment and supplies for the everyday operation of the grounds and villas.
. Here's the view from the terrace on the main house, Casa Grande, and inside is the sala, 55 feet long, including several distinct conversation groupings, among them the fountain area below and a wet bar with informal dining area at one end. One feature of the sala is the fountain area with a working fountain. 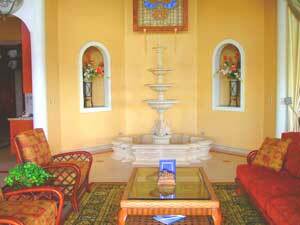 Like all the other furnishings that come with this wonderful estate, the fountain is of highest quality. On the second level, the master suite is spacious and comfortable, to say the least, with a cathedral ceiling, private breadfast area, rich furniture, and its own beautiful views.